Connecting the dots between Operational Technology and Continuous Improvement. Continuous Improvement is a term that covers the ongoing development of products, processes, and services in either incremental or breakthrough innovations. There are many techniques for Continuous Improvement, and within a single company it is not rare for numerous different strategies to be used, as different methodologies are better for different use cases. Continuous Improvement is also often referred to as ‘Continual Improvement’, though these two terms are technically different in their scope. 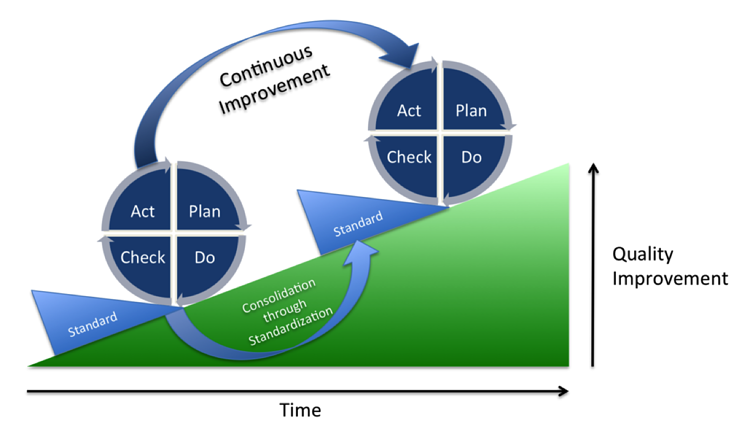 ‘Continual Improvement’ was a term coined by W. Edwards Deming, which covers all processes of improvement including ‘discontinuous improvement’. ‘Discontinuous Improvement’ refers to many different approaches to many different problems without a rigidly defined system. ‘Continuous improvement’ in its strict meaning refers to a subsection of continual improvement focused on linear, incremental improvement within a single process. Given the universality of the desire to improve business, many different concepts and schools of thought have developed around the idea of continuous improvement. No one method is guaranteed to provide a the best solution in every case, and each one has different strengths. Below are some of the tools and systems used on individual projects, larger scale analyses, and full-company cultures. Also known as the Deming Cycle or the Shewhart Cycle, this process involves four steps for carrying out change. Act – If the test yielded positive outcomes, implement this knowledge for wider changes. If not, go back to the beginning of the cycle and begin again from Plan. Given the simple framework for this concept, it is most effective at tackling small problems for incremental improvements on many fronts. It can be used for streamlining a repetitive work process, developing a new product, process or service, or as a proof-of-concept for larger ideas. In a company looking to adopt IIoT systems into its plants, a PDCA Cycle can be used to successfully implement pilot programs. Its cyclical style makes it ideal for incorporating small changes into different iterations of tests, allowing great flexibility when starting a new improvement project. PDCA is also good for planning structures to collect and analyze data from a series of tests to identify issues and their causes. Originally developed in the 1920s by Walter Shewhart, Statistical Process Control (SPC) is a way of monitoring process behavior primarily through the use of control charts. A control chart allows for swift notice when a process returns a result different from the norm. Control charts identify two kinds of variation, Common Cause Variation (CCV) and Special Cause Variation (SCV). CCV is the inherent imperfection in any process that cannot be avoided. SCV stems from external factors that push the process outside statistical control. Tests can determine when a SCV has occurred. However, when more tests are used, the probability of a false alarm actually rises. Companies still use this system today, and it is an important component of other Continuous Improvement systems like Six Sigma. Data-gathering instruments and statistical analysis software have also enhanced the accuracy and precision of SPC. Other tools like Cumulative Sum (CUSUM) and Exponentially Weighted Moving Average (EWMA) charts are specialized descendants of the original SPC methodology. Six Sigma is a detailed and intensive process intended to counter major production problems and inefficiencies in manufacturing companies. The system provides organizations a set of tools to increase performance and reduce variation in process and product. Using this system, plants can increase profits, reduce defects, and improve employee morale. Different teams are assigned to take on highly specific projects explicitly designed to affect the company’s net profit. Some individuals are trained in “statistical thinking”, giving certain team members advanced project management training. Levels of mastery in the system are defined by “belts”, with black belts being the most advanced statistical thinkers. This reference to karate evokes both the discipline required by this method, and the strict hierarchy of belts and other Six Sigma roles. Another core feature of Six Sigma is an approach to problem-solving is a modified version of PDCA called DMAIC. While very similar to PDCA, DMAIC is tailored more specifically towards the needs of the Six Sigma's workflow. Finally, Six Sigma requires a management structure that fosters these programs, provides consistent training, and is flexible to changes suggested by project groups. While often paired with Six Sigma when executing continuous improvement projects, lean manufacturing is a different process with a different goal. Lean Six Sigma is becoming a more popular term over time, but where the primary goal of strict Six Sigma lies in reducing variation, the core idea of lean manufacturing is introducing tools and processes that reduce waste. Like the rest of the items on the list, if a company is spending resources on something that does not directly help bring the product to the customer, that can be considered a 100% loss. To further minimize loss, highly intensive applications of this method require that company suppliers and subcontractors also follow lean principles to achieve maximized results. The toolset of lean manufacturing involves more holistic than technical approaches, including kaizen, workplace organization and visual checks. These blend well with the statistical data analysis, experimental design, and scientific test method of Six Sigma to create powerful, company-restructuring solutions. Total Quality Management is a long-term strategy for success based on the idea of customer satisfaction. TQM involves the entire company, with every worker participating in making products, processes, and services better, as well as improving the company culture. TQM’s customer-centered approach to continuous improvement uses data, business strategies, and strong communication to create a culture of high quality standards. Many companies will use these principles as a core function of day-to-day operations, building Continuous Improvement into the fabric of the culture. For companies implementing TQM, a framework can be found in W. Edward Deming’s 14 Points. The food industry derives its revenue from low profit margins balanced against high-volume sales. Continuous Improvement can help ensure that companies stay profitable even with unforeseen circumstances, especially in an increasingly competitive environment. The strategies offered by Continuous Improvement provides flexibility during market changes, streamlines work, and reduces waste. One simple but oft overlooked way to improve process efficiency is to make the job more comfortable for the worker. Making tasks less physically stressful for workers can save injury losses, reduce product and capital losses, increase speed and efficiency, and reduce cleanup time. Showing care and thought towards workers also boosts morale, making them feel like they are important to the company. The status quo for packaging is rarely if ever the best way, and there are many capital and resource-saving options for companies. Recyclable or reusable packaging can cut costs and improve efficiency while also being better for the environment. Reengineering packages to allow for the same safety and security with less material is another sustainability win that is beneficial from a purely financial standpoint. Everywhere there is cost, there is a chance for Continuous Improvement to reduce loss. Despite great benefits, many still worry that the cost of implementing a Continuous Improvement culture will not be worth it as IIoT and automation become more popular in food manufacturing companies. However, computer algorithms will never be a replacement for creative solutions and strong company culture. The questions of where and how to apply automation still need to be answered, and Continuous Improvement teams can ensure solutions are made where they are most needed. 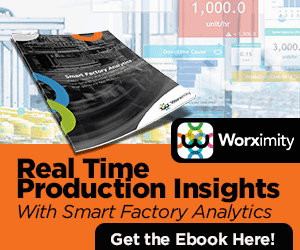 Smart Operational Technology enables manufacturing businesses to understand where opportunities for maximum gain from Continuous Improvement initiatives lie and empower Continuous Improvement teams to independently make decisions that lead to the quickest ROI. Like all business systems and strategies, the only way to experience the full effects of a Continuous Improvement culture in a company is to introduce it properly. Just over half of manufacturing companies now have formal improvement plans, so now is the time to make the change in order to stay competitive. The challenge of converting to a Continuous Improvement mindset is the necessary culture change a company must undergo to support it. It is often difficult to mesh different methodologies and support early gains experienced when first introducing Continuous Improvement. This can be a result of incomplete training, and a following lack of initiative to maintain the culture. Specialists from outside the company are only effective if the company continues to engage workers in the system. Otherwise, when they leave the changes made will quickly deteriorate. The incentive is strong to keep Continuous Improvement specialists in the company, assisting new trainees on improvement projects and managing major overhauls. For food manufacturing businesses looking to embark on Continuous Improvement, you can learn about 3 of the easier to implement yet still powerful continuous improvement tools here. A Continuous Improvement-based company is driven from the bottom up with all associates applying the mindset to their daily work and looking for improvements. Devoted, self-directed teams within each department are great for countering large inefficiencies, but to maximize profitability floor workers and lower-level employees also need basic training in Continuous Improvement ideas. The strict lines of hierarchy need to be erased, and managers who cling to subordinating their workers’ ideas must be removed. Great innovations can come from anywhere, and it’s especially important to listen to the workers operating the machinery and seeing the inefficiencies in their own work every day. "Hi, I'm Carole. I am a Data Scientist who has a background in industrial engineering. I have experience in performance analysis and operations management. In my day-to-day functions, I aim to always give meaning to data to help the manufacturers make smarter decisions." "Hi. I'm Adrian. I manage Project deployments, customer training and value-added data analysis using my experience as a project engineer for different types of manufacturing operations, focusing on the client’s IIOT platform onboarding."